Belgian Gymnastics: Veel succes, Justine! Last month, Justine Sterckx (TK Sta Paraat-P.H.H. Hasselt vzw) has decided to retire from the Belgian Elite gymnastics scene. Born in 2001, this year was Justine's first year among the Juniors. She trained at the Elite center in Ghent. 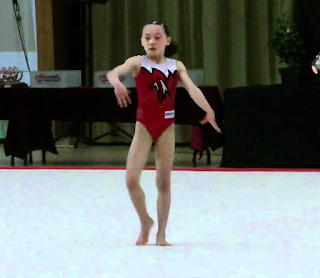 She competed at the Wase Gym Cup in 2013, where she was 4th in the all-around and 8th in the floor exercise final. In 2014, at the Tournoi International of Combs-la-Ville, she ranked 5th in the balance beam final and 5th with the team (Espoirs). This year, she competed at her first Belgian Championships as a Junior, championships where she placed 6th in the all-around and got the second best score on balance beam. In May, she was selected to compete at the first edition of the Flanders International Team Challenge in Ghent, where she helped the Junior team by competing on vault, balance beam and floor exercise. We wish Justine all the best for her future!